Joy has always been told by her Grandmother that she will go on to be something in the world, using her gift of creating things to totally change her life around. This is something she had thrown at her from a young age, she was creative and her grandmother encouraged her to use her “gift” oh I almost forgot to mention that she is actually narrating the film. So we are being told Joy’s story. 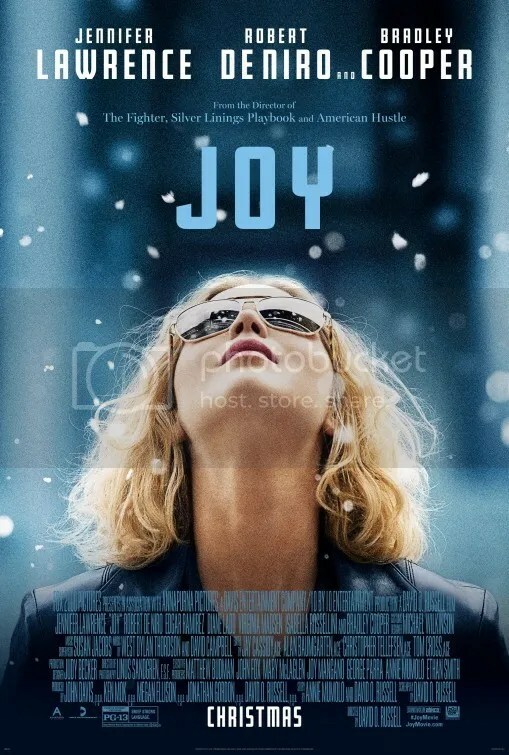 The thing is though Joy’s story is not great at all, she didn’t go to college after being top of her class in High School and stayed to help her mother after an awful divorce from her father. She gave up things straight away with that, but then through her best friend she met a man and married him having two kids. This is where we see her life has fallen apart, divorced for two years and her husband is living in the basement, her mother doesn’t leave her room, her father is back and two kids to look after in a house that is also falling apart needing so many different repairs. It is not really clear if she is going to get something to change everything around, but that does happen. She decides to design a new mop that will help change everything from the conventional mop. The problem is we then have to sit through scenes negotiating getting the money to make it from her fathers new lover. Or the trying to then sell it. Or the problems with the “pattern design” and other small details that don’t really make a very good cinema film. It just felt from the start that it was a made for TV film and that’s where it should have stayed, although we wouldn’t have Lawrence, De Niro and Cooper in that one. But I think it’s worse that I feel cheated by this film. The talented cast and performances in a mundane and lifeless film, which I think is being marketed as something totally different. I don’t understand how it is meant to make you feel good or fill you with hope as it actually has the very opposite effect as well as hoping it is almost over. Bizarre. I feel that is the best word to sum up this film, as I really don’t get the relevance of the awful daytime soap playing into the story at the beginning and then totally disappearing, not that I wanted it to come back far from it. Just strange and why? I do throughly enjoy Jennifer Lawrence and will follow her career and watch which ever film she is in as I think she does have a magic to her. While she is still impressive in this one, I think it is probably the worst character she has had to take on so far. Disappointment with the lack Cooper was involved and even De Niro to a certain extent I think we could have had a lot more from his character. One more thing I think leads to the disappointment is that the characters are not likeable at all, each wanting to put their own success ahead of anything else and not really coming across as a good family unit at all. I don’t know this just left a bad taste in my mouth and felt liked a wasted trip to the cinema. Anyone feel differently to this? A friend saw it and pretty much said they wanted their time and money back after they saw it! Yeah that sounds spot on! Hope people avoid this one in all honesty. No that is perfectly fine, I think I’d passed the point of no return by the end as I really just wanted it to be over and didn’t care what actually happened to her! The critics seem to be split over this one but surprisingly I really enjoyed it. A strong performance from Jennifer Lawrence certainly carried the film but I found the characters and the film overall really quirky and offbeat. Good to see well established actors in supporting roles (Isabella Rossellini, Virginia Madsen and Diane Ladd). Also an excellent soundtrack ranging from Buffalo Springfield to Nat King Cole. My rating 7/10. It was doing my head in watching it and trying to remember who Isabella Rossellini was 🙈 Haha. I just think I was expecting something more like Silver Linings, Jennifer Lawerence was terrific as ever though! Isabella unforgettable in Blue Velvet! Now that’s a strange film… loved it!! Oh I’ve never seen that one. Is it wrong that I totally reference her with the friends episode with the list?!? I don’t really know her tv appearances. She has been in a lot of films notably Death Becomes Her and the outrageous Wild At Heart. Eh really she’s in Death Becomes Her!! !